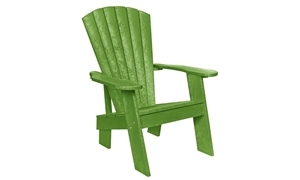 Sit back and relax on this durable, worry-free Adirondack chair. Its ergonomic design features a comfortable curved back, and is crafted in Canada from 95% recycled plastics and finished with a wood grain in a UV-stabilized grey color so that it won’t rot, splinter or fade. The heavy-gauge plastic lumber is held together with marine-grade stainless steel hardware for added durability, totaling 58 pounds in weight to prevent it from tipping over or blowing away on even the windiest days.